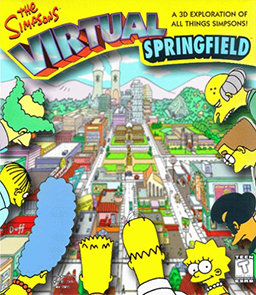 The Simpsons: Virtual Springfield is a Windows and Macintosh computer game released in 1997 and published by Fox Interactive. It was developed by Digital Evolution. Similar in format to first-person exploration games like Myst, Virtual Springfield allows one or two players to explore a 3D simulation of Springfield, the fictional town featured in the series. Many of the show's more familiar locations are present, including Moe's Tavern, Krustylu Studios, Springfield Elementary, and 742 Evergreen Terrace. Players can point and click to interact with characters and settings. The objective of the game is to unlock all secret areas within the map. The game has the nominal overall goal of collecting an entire set of character cards, but their hiding spots can be used more than once. In fact, there are several times as many cards as there are hiding places. Once all the character cards are collected, another card appears in the player's collection, giving the URL of a (now defunct) "secret website" featuring "Frink's Matter Transporter" (a cheat that allows the player to jump to any featured location instantly) and Otto's map of the town, with directions of all the non-interactive locations in the game (Gulp 'n' Blow, Herman's Military Antiques, popsicle-stick skyscraper, etc.). There are also several "secret items" to collect, which in turn are used to unlock secret areas. 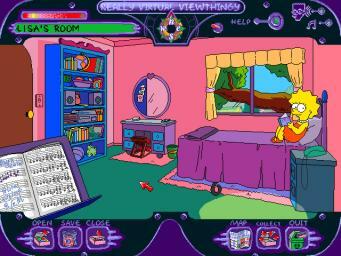 The game features dialogue written and recorded by The Simpsons cast and writing staff. Modified on February 15, 2016, at 12:14.